And I ran him through with my blade! “I have killed a man!” I said. “They sent me to kill you,” he sighed. “By God! I wish you had done so!” I swore. “Nor I,” he breathed, and he died. When we kill with drones, and bombs, and land mines, and airplanes we never have to look them in the eye and see their humanity. Nor do they! What’s all this fighting for? Oil? Religion? Land? Power? Politics? You be the judge. 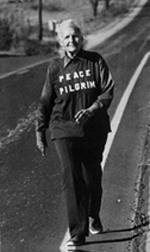 The Peace Pilgrim walked across America talking about peace, working with the anti-nuclear movement, and the anti-war movement most of her adult life. From 1953 until 1981 this silver-haired woman, with cheerful obedience to her calling, was a server in the world. As she approached each country hamlet or sprawling city she carried to all she met a message of peace expressed so simply: When enough of us find inner peace, our institutions will become more peaceful and there will be no more occasion for war (2004 page xi). Many people have never heard of her and I hope this little blog about her will inspire you to order her free book from the Friends of Peace Pilgrim at www.peacepilgrim.org or friends@peacepilgrim.org. She walked across this country with nothing but the cloths on her back and a vest with pockets where she kept all she believed she needed, paper, pencil, envelopes, and stamps. She ate only when invited to by strangers and friends. She slept outdoors unless invited into someone’s home for shelter. She walked over 25,000 miles before her death in a tragic car accident on her way to give a talk on peace at a college. She spoke to young people on college campuses, people in churches, and parks, and on the roadside everywhere she went. During her years on the road she was picked up and jailed several times for vagrancy because she carried no money, but she said, “they always release me once they understand (page 33). When she went in front of the judge in one state they released her because they found this letter in her vest pocket. It read: The bearer of this note has identified herself as a Peace Pilgrim walking coast to coast to direct attention of our citizens to her desire for peace in the world. We do not know her personally as she is just passing through our state, but since undoubtedly it will be a long, hard trip for her, we wish her safe passage.” It was on official stationery and signed by the governor of the state, Howard Pyle (page 34). I know that I would not have the courage or the conviction to spend my adult life on the road for a cause such as this, but she did and was able to raise the thoughts and minds of thousands of her followers, college students, police, and politicians and ordinary citizens through her convictions and drive to see peace in the world and disarmament of all nuclear bombs that she believed could and would destroy the planet as we know it. This war mongering again from some American politicians and their followers is just what she gave her life to upend and what brought this little book on my bookshelf into my hands this morning. As such I end this post with a poem that she wrote. I hope you share it with everyone you know to help stop the war mongering, shouts, and actions toward war that are here among us today. This I wish for you and for all our politicians in every country around the world. This kind of zazen practice teaches us to sit upright wherever we are. Sometimes our mind is calm and sometimes our mind is busy. Sometimes we feel peaceful, and sometimes we are in the midst of a storm. We neither cling to nor avoid any condition, but keep sitting in an upright posture. We try to live in this upright manner, not only in zazen but in our daily lives. When we deviate from uprightness, we are aware of it and return to it (page65). And so, do not be deceived by the idea that you can only be peaceful when you are actually sitting, meditating, or praying and that once you’ve completed that task you go back to the chaos of your daily life. In Zen your life is always based on the energy of sitting, the consciousness of sitting. When walking we walk straight and tall conscious of our every step, our eyes are tuned to “seeing” all things around us from the things that are close up to the things that are far away. We try to stay in tune with our immediate environment and in doing so it helps keep our mind from wandering into the past where fear, anxiety, regret, sadness, and disappointment may live, or living with expectations for the future of joy, happiness, love, and peace. As the text says, “we neither cling to nor avoid any condition.” So when a fearful or negative thought enters our minds and disturbs our peace we do not chastise ourselves, get mad at ourselves, or criticize ourselves, we simply recognize the thought, thank it for coming, give it no power over us and move on. We do the same with the “happy” thoughts. Do not cling to either—simply observe and then let go. Regardless of where you are or what you are doing, driving the car, working, doing dishes, taking care of the children, or watching TV live every moment as though you are sitting zazen: focused, fully aware, patiently observant, and in the “now” moment. And when you do you will be surprised at how creative, productive, successful, and in tune with all that is you have become. I encourage you to walk with me on this path of Zen, try it, I think you’ll like! Today is the day I’ve decided to write my first blog post for the KUWC, and like all writers I am a little nervous about the whole thing. Will it be good enough? Is the grammar, punctuation, and sentence structure correct? I wonder if the other faculty members will like my writing or if they will think it is boring, simplistic, or uninteresting. Wow! While all of these thoughts are running around in my head how can write? I can’t!